As more people visit coastal beaches in spring and summer, potential interactions with marine mammals increase. Marine Mammal Stranding Network representatives from the Seaside Aquarium work to help prevent injury to marine mammals or the public. They post signs near stranded animals and talk with the public about the dangers of interactions with these wild animals. 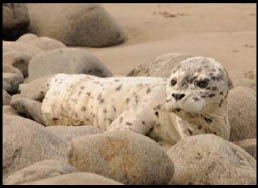 Call 503-738-6211 to report stranded marine mammals , including baby seals, in the area. 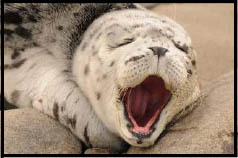 Serving as the North Coast faction of Oregon�s Marine Mammal Stranding Network, Aquarium staff regularly deal with marine mammals that wash ashore. Over the years, they have seen gray whales, sperm whales, even a Dall�s porpoise. They were surprised to discover a baby minke whale in the surf this May. 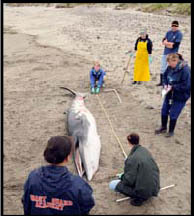 This was the first minke to wash ashore in this area in over ten years. This animal was probably between one and two months old and was only 13 feet long, a very manageable size for study. 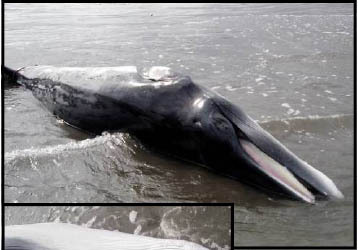 Adult minke whales can grow to 30 feet long. 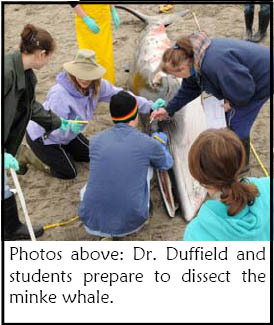 Dr. Debbie Duffield, head of the Marine Mammal Stranding Network brought her upper division Marine Mammal class from Portland State University to the coast to examine and dissect the animal. Aquarium staff assisted in the dissection. In addition, students from the Engineering Department at Oregon State University took cross-section samples to examine how the tissues, blubber, and skin connect as part of a study to make better tracking implants. Tissue and biotoxin samples were sent to various agencies and the skeleton will be articulated and put on display in the Vertebrate Biology Museum at Portland State.